Milpark Business School, private provider of tertiary qualifications in commerce, will launch two new qualifications in 2013 – a Bachelor of Commerce (B. Comm.) and a Higher Certificate (H. Cert.) in Office Administration.The B. Comm. and H. Cert. (Office Administration) are designed to provide school-leavers with solid qualifications relevant to a wide range of careers in commerce. Adding these to the existing BBA degree contributes to meeting the urgent skills requirements of the South African business sector. The Higher Certificate in Office Administration is designed to equip school-leavers with the skills needed to work in a variety of administrative contexts. Matriculants interested in the administration and day-to-day administration of a business will find this qualification the perfect tool to jump-start their careers. Students who choose the Higher Certificate will study a range of subjects addressing areas critical to administration including business practice, business law, computing and communication. Milpark also offers candidates a choice of a specialised module that provides more focused knowledge in a particular area of administration – financial services, legal, accounting or public sector administration. Milpark offers various learning options from full-time contact learning to part-time and distance learning. “Modern academic institutions have to be flexible and responsive to the circumstances and needs of their students. Our courses are offered in modules and the various modes of delivery to enable our students to earn while they learn, if they can’t afford to study full-time, or if they want to improve their skills without leaving their jobs,” says Venter. 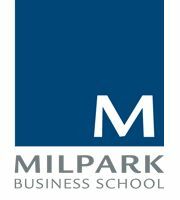 Milpark Business School operates from two teaching sites in Johannesburg and Cape Town, and has a sales and support office in Durban.